The London Book Festival - honoring the best of international publishing. DELIVERING DREAMS - honorable mention! Detail from the forty eight inch foldout spread. With the last of the leftover turkey and stuffing comes the stuffing of our mailboxes. One of the more cherished traditions this time of year is the giving and receiving of Christmas cards. While opening envelopes, licking stamps and filling your coffee table with pictures and well wishes from loved ones, have you ever wondered where this tradition began? According to the Smithsonian Institute, the first Christmas card was mailed in England by Sir Henry Cole in 1843. Best known for founding the Victoria and Albert Museum in London, Cole was a socialite with an overwhelming amount of letters that warranted a reply. As he was fretting over how to reach out to everyone without becoming a full time pen pal, he had an idea. And with that, the Christmas card was born. The Christmas Card traveled to America 30 some years later from Cole and Horsley’s creation. Louis Prang, a Prussian immigrant, made postcards with a flower and the text “Merry Christmas” in his print shop outside of Boston in 1875. Throughout the years, Americans developed all sorts of formats for their well wishes, from lithographs to postcards. There has been one that’s seemed to stick. The Hallmark Company is credited for creating the format of a cardwe use today, the 4x6 card folded once in an envelope, in 1915 in Kansas City, MO. Despite our increased preference for all things digital and the decline of all things print, we still value Christmas Cards as a holiday tradition, maybe more so than ever. According to the Greeting Card Association, the UK public spent more on greeting cards in 2015 than ever before – taking the market value up to a value of £1.7 billion. It’s not a surprise that people still love them. In a busy world, giving and receiving Christmas cards is a rare opportunity to slow down for a minute and connect with those most important to you, no matter where they live. It’s some sort of magic that just by opening an envelope, we can watch families we love grow, travel, and experience the best of life. Not often enough do we send mail with good news and love. As long as we cherish the holidays, we will cherish Christmas cards. Also, if you haven’t sent yours out, let this be a reminder! "The Moonbeam Children's Book Awards are intended to bring increased recognition to exemplary children's books and their creators, and to support childhood literacy and life-long reading. The Awards recognize and reward the best of these books and bring them to the attention of parents, booksellers, librarians - and to children themselves." Sign up here for the latest updates. A simple sketch holds within it all of the the qualities, inner promptings and passion that makes the final painting come to life. If I ever lose my way in a painting, I go back to the original sketch, to once again feel the essence of that which seized me in the beginning. A great big round of applause to all of you for the spectacular patience you have had as this project has moved along. Since it began, we have built a website, opened an Etsy store, planned an upcoming series of exquisite limited edition prints and have also added beautiful journals, studio prints and seven new cards to the shop. In addition to all of that, we have created inspiring new products that will accompany the book release. 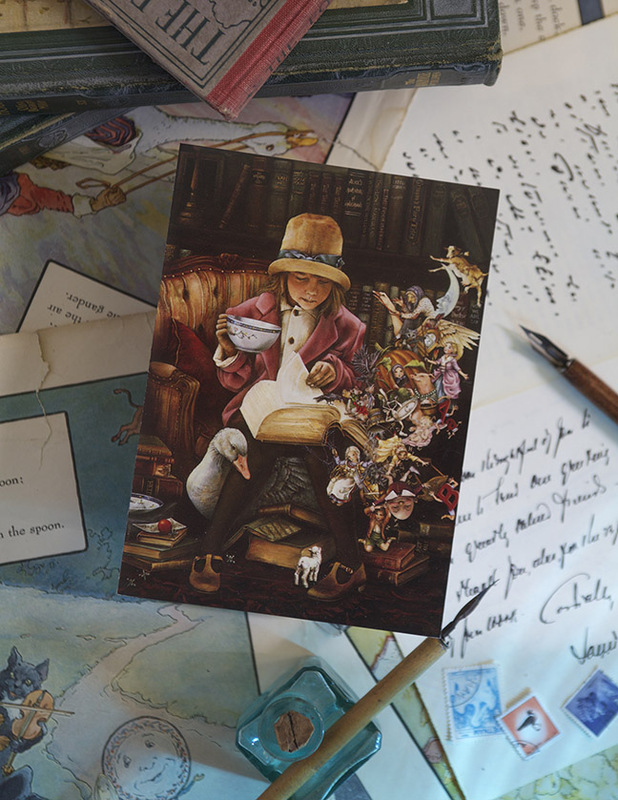 A Delivering Dreams correspondence set to inspire connection through hand written letters and four giclee prints depicting magical adventures from the story will be offered. We are in the process of sourcing a printer and although we are rushing to be ready for Christmas, we can’t say for certain until the next update....so please stay tuned for a bit longer. Thank you all. It is our hope that "Delivering Dreams" will inspire children to follow their true nature and live joyful lives that are in alignment with all that they love and dream of. Now you can save money and get more of what you love. A quantity discount for 10 or more cards of the same design is now available for any card in the shop. It is a great time for buying Christmas cards or stocking up on your favorite Dandelion image. Each wondrous painting by Lori Preusch starts out the same way. With a dream, a vision and a planned escape into that all captivating world of the inner child. But before Lori can open the door to that world, she takes something special from this one. A simple, sable brush. It was never designed for the acrylic paints she uses…let alone the rough canvas that it dances on stroke after stroke. Yet, with it she blends precision with dexterity, which allows her to create the subtle soft tones in a polar bear’s protective embrace or the gleam and light that shines from the rainbow of colors surrounding a child. By carefully layering hue upon hue, Lori begins to build each story as it unfolds before her, letting the paintings become what they want to be. And, by the end of the day, this once soft, silky brush is all frazzled and worn from passionate use. Yet, lying in an old wooden box in the corner of Lori’s studio in another #000 sable brush…just waiting for the day it is chosen to luminate the canvas and bring to life one more treasured memory of a world where anything is possible…and everything is magical. Where do ideas come from? Everywhere is the answer! The artistic impression this fine couple have made, after decades of nesting on the pond's edge at Dandelion Press, is evident in "Midsummer" below. Once you have your stem, it is time to think about your wish. Important rule, never tell anyone for what you are wishing. If you are making a wish primarily for yourself it is always a good idea to tack one on for a friend. It always helps a wish to travel with a friend.